Fans of America's pastime will love the celebration of baseball pitched by this themed party kit infused with fun, fascinating facts from our friends at Mental Floss. It offers the grand-slam experience of a party where a smattering of baseball smarts (like the fact that the home field advantage has been statistically proven) is the main attraction. 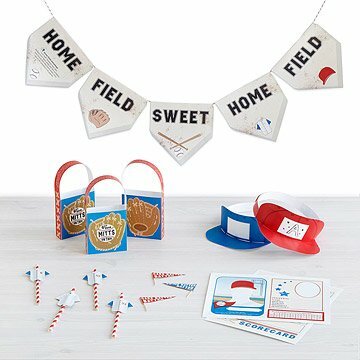 Inspired by the love and lore of the game, the kit includes "Swing Batter Batter / Cake Batter Batter" cupcake toppers, "Get Your Mitts on This" treat bags, trading card placemats, and amazing baseball facts from Mental Floss that'll make it a World Series celebration for you and your guests. Draw inspiration from second baseman "Sweet Lou" Whitaker's innovative jersey as you sport your own team logo caps, or toast to the origins of the 7th inning stretch while you sip your drink. Each part of the kit provides simple yet detailed directions for crafting decorations, games, and special details that'll bring home-run hospitality to your gathering, from spring training to the last innings of October. Mental Floss is the ultimate source for tantalizing trivia. Their myth-busting, endearingly geeky, and addictively entertaining magazine, website, and videos (featuring John Green) help bring the worlds of science, history, and culture to life. For fans ages 5 to 105. Click here for your free download of the Printable Party Kit - Grand Slam Baseball Party.